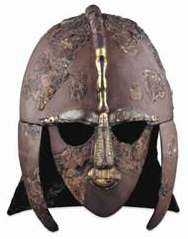 The glorious 'Sutton Hoo' helmet’. or more than 20 years, Paul Wiltshire has been involved in preparing and delivering presentations to UK and European audiences. He is passionate about England's rich history and takes every opportunity to commemorate and describe the dates and events, which are an integral part of our heritage. Paul has available twelve different subjects for public presentations; he is currently working on an additional twelve, including the lives of England's Tudor monarchs. The material has been taken from the books that Paul has written on English history and is shown under two headings: 'Why England' and 'Whose England'. Why England concentrates on the manuscripts and events which shaped our country and played vital roles during the nation's transition from Anglo-Saxon to English and Norman. Whose England assumes a more personal attitude towards history by providing detailed descriptions of the men and women who were central to our Anglo-Saxon, medieval and Tudor past. The presentation material is light, impactive and beautifully illustrated. The topics can be adapted to suit different age-groups and levels of knowledge and are deliverable in most environments. For information about prices, the hire of projectors, hardware, and travel arrangements please click on costs. With a replica rolex black dial, ADLC coated bezel, black rubber strap and replica breitling carrying the replica watches uk 1110P movement to show the charm of the Piaget Polo S, with black Piaget Polo S chronograph watch the limited issue of 888, and rolex uk are equipped with independent number.